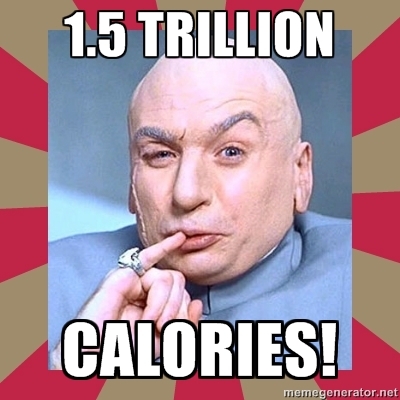 Weighty Matters: 1.5 Trillion Calories! According to press releases and nonsensically breathless articles like this one out of Forbes, last week's announcement from the food industry that they'd removed 1.5 trillion calories from the food supply was huge. When broken down by person it amounts to 14 fewer calories purchased per person per day last year from vending machines, convenience stores, drug stores, grocery stores, supermarkets and mass merchants. And that's not a bad thing and were it truly consequent to the food industry shaving calories off their products it'd certainly be worth our giving them a gentle pat on the back, but I guess I'm stuck trying to understand both the market forces that may have led to the reduction, as well as whether or not the reduction occurred despite the food industry's best efforts, not because of them. Could the reduction not simply reflect shifting societal attitudes and norms and in fact have occurred despite the food industry's persistent, tenacious, merciless and at times deceitful and ethically questionable marketing of salt, sugar and fat? I'm curious too to see the independent non-industry analysis of these results which is currently being undertaken by Dr. Barry Popkin and his colleagues. All that said, 14 fewer calories per day aren't likely to take us too far given that estimates suggest we're eating 500 more calories per person per day since the early 1970s. Still plenty of work to do on the remaining 486.